By late summer / early fall, some adult Yellow-bellied Flycatchers may appear grayish white below…a far cry from their deep and bright early-spring finery; most of their fall molt is completed after their arrival in the wintering grounds. All eastern Empidonax flycatchers can show buff-yellowish tones throughout the underside, and, when availing a fleeting view in certain lighting conditions, can appear similar to Yellow-bellied throughout the underside, except for the throat. Just yesterday I was taken aback re: how bright and colorful one Least Fly’ was; for a split second, I thought for certain it was a Yellow-bellied. Photo: A comparison of a relatively drab Yellow-bellied Flycatcher (right) with a Least Flycatcher (photographed by Kyle Blaney, http://www.kyleblaney.com/, at left). 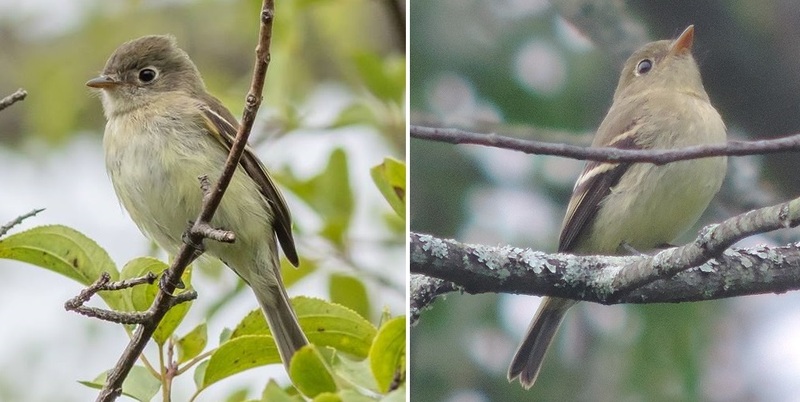 Photo: A comparison of a relatively drab Yellow-bellied Flycatcher (right) with a Least Flycatcher (photographed by Kyle Blaney, http://www.kyleblaney.com/, at left). Ventral view. With YELLOW-BELLIED, the overall GISS is that of an especially large and round-headed flycatcher with a moderate primary projection and a proportionally short tail. Note the high-contrast between the jet black wing and the green back; the orange-yellow lower mandible to its proportionally stout bill; and its dusky-yellow throat is unique among eastern Empids. Generally, the eye ring is quite pronounced, esp. along the posterior edge, and sometimes shows a light teardrop shape. The high-contrast black wing -> greenish upperparts is consistent regardless of the age/molt scenario. Personally, that’s my go-to for distant, flitting birds. With LEAST, the overall GISS is that of a large-headed flycatcher with a relatively short primary projection and a short and thin tail. The tones throughout the upperparts are light-medium brownish-gray; the throat is off-white and shows contrast with the medium brown-gray to the sides of the head; the eye ring is usually quite bright and well-defined; and the bill is relatively small re: both its width and its length. Scenario: A beautiful, sunny, late summer’s day….. in flies a vividly colored and bright fall Least (for example, a juv) and from the thicket stirs a drab adult Yellow-bellied = an honest ID challenge indeed….consider it accepted! Whitney, B. and K. Kaufman. 1985b. The Empidonax Challenge: looking at Empidonax. Part II: Least, Hammond’s, and Dusky flycatchers. Birding 17: 277-287. Whitney, B. and K. Kaufman. 1986b. The Empidonax Challenge: looking at Empidonax. Part IV: Acadian, Yellow-bellied, and Western flycatchers. Birding 18: 315-327.